Members of the RIR team talk about their activities, feelings, hopes, expectations and memories about the festival of colours. “I live in New Delhi and my children go to the Russian Embassy School. Our school has close ties with a number of Delhi schools and universities. This year we invited students from the Delhi University to play Holi together and my children got very excited about it. We bought colours and water balloons; and the celebrations turned out to be a lot of fun! “I love Holi! But I’m a bit cagey about the kind of people I celebrate it with. I mean, the last thing I want is axle grease in my ears. Though I’m not a member, I go to the stunning ISKCON temple in Auckland because they have the trendiest dancers and vegetarian food to kill for! Plus, the environment is multicultural with Indian, Chinese, Kiwi, Russian, British and Dutch members. I make it a point to wear my whitest shirt so that when I return after playing Holi, my neighbours are fooled into thinking this seemingly sober chap is a party animal. Anyway, after a couple of hours of Holi in the rain, my skin had an eerie pink tone while my hair was all punk. 24 hours later my skin and hair are still pinkish. Thinking of taking Wednesday off from work! “It’s been a heartfelt desire of mine to celebrate Holi near one of Vrindavan’s temples, but then thinking of the damage that could be caused to the holy places, I stick to my housing society in Mumbai. Surprisingly, many of my Indian friends would prefer sitting at home and watching TV rather than playing Holi even among a small circle of family or friends. They have some justifiable reasons, clothes get spoiled, the skin and eyes could get affected by chemical colours, leave alone acids mixed in colours that people through during Holi. There’s also the risk of poisoned Bhang in the streets. As an animal lover I also feel bad for strays who suffer the most during Holi. Apart from general fear and discomfort dogs, cats and cows experience when thousands of people poor into the streets, chemical colours may cause respiratory allergies and skin infections. It definitely was not the case decades ago when people of all ages, occupations and religious beliefs enjoyed the festival without any fears and discomfort. Today celebrities, government authorities and environmental activists urge using chemicals-free colours and water balloons while keeping in mind the idea of saving every drop of water. Many NGOs across India produce gulal, pichkaris and water balloons made up of organic products, therefore apart from overall masti, Holi can be a good chance to support NGOs and rural communities they engage. If there’s one place I could choose to celebrate Holi, it would be Varanasi, one of my favourite cities on the planet. I would love to wear a plain white kurta and get completely immersed in the colours at one of the famous ghats by the Ganges. While I think this is a wonderful free-for-all festival, I would agree with my colleagues and friends who advocate the use of organic products and non-toxic rang. The most memorable Holi I have celebrated till date was in the Nepalese capital of Kathmandu. The tourist ghetto of Thamel was transformed into a war zone with locals and foreigners indulging in pitched battles with colour and water. Of course, it was in good fun. We then proceeded to the Patan Darbar Square, which provided a perfect historic and cultural setting to celebrate the festival. It took days for the colours to wear off my face and scalp. 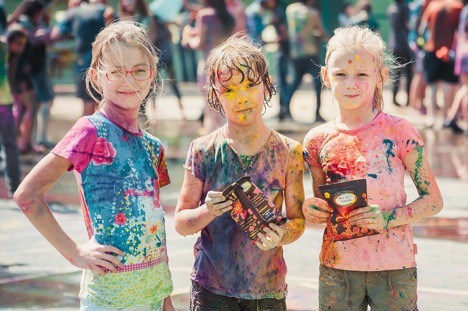 It’s also very heartening to know that Holi is also being increasingly celebrated in Russian cities such as Moscow and Vladivostok. Of course, the festival is not strictly celebrated on the same day as it is in India and Nepal, but the participants at the well-organised festivities are enthusiastic as their counterparts in the subcontinent. Vodka is a decent substitute for Bhang! Happy Holi to all of you from the RIR team!